Would you like to be fitter, healthier, stronger? Most of us would and most never achieve it to the level they want because, well, it’s hard. It’s a real challenge and it won’t happen just because you want it to or because you have good days. It’s the same for business – it won’t be fit and strong just because you want it to be or because you have ‘good’ busy days. Both need focused effort and guidance and the return is always proportional to the investment. Invest in the effort to get down the gym and to eat the right food and in return you’ll lose weight and get fitter quicker. Invest in the effort to make your business fit and strong and it will grow quicker and be more resilient against harm. People who want to be fit and healthy and stay that way often need help to keep them focused and disciplined – so they invest in a personal trainer. Business leaders who want the same for their business need the equivalent to a personal trainer – they need a great strategy…and here’s why. A personal trainer carries out a health check and finds out your age, how much you weigh, your height and your fat to muscle ratio and past and present injuries. He will then test your level of fitness and your strength. He does this because he doesn’t want to set unrealistic targets and he doesn’t want to injure or demotivate you. How much time the owner spends in the business compared to steering it. A personal trainer will ask you about your long term aspirations – do you want to be fitter, stronger, slimmer, lighter…a combination? She will set goals to reach over a specific period and break those down into smaller, possibly monthly, milestones. These milestones should be challenging but realistic – they should keep taking you closer to your goals and aspirations but be based on your current physical state. If they aren’t then at best she risks de-motivating you and at worst injuring you. A great strategy will start with the end in mind. Why does you business exist? What is your long-term vision? Because this vision could be many years off, it should define a major milestone that can be reached within the next. Your strategy should then break this vision down into major stepping-stones or strategic destinations. These could be 3 to 5 years off and so the journey needs to be broken down further into annual goals and these goals into smaller, quarterly and monthly milestones. The goals and milestones will of course take into account the current state of your business and, just like a fitness program, should work to strengthen weak areas, identify and mitigate for risks and exploit strengths as well as drive you towards the next milestone. With where you want to be and where you are now the trainer will create an exercise and diet plan – a route to achieving your health aims, mapped out and connected by regular milestones. This will be a plan of the number of exercise sessions you need to do each week, the exercises you need to do in each session and the targets you need to try and hit for each exercise. And what you should eat and drink along the way. This is the ‘how to’ plan – how you are going to lose a stone, increase your fitness level to the goal of being able to run for an hour or whatever goals you have agreed. Your strategy plan will comprise the detail of how you intend to meet the milestones and hit your business goals. These are your objectives and they spell out the specific tasks and actions that you need to implement on a monthly and weekly basis in order to reach your milestones and goals. This is the hard part. You and your trainer have set the plan, now you need to do it. At least you won’t be making it up as you go along. You’ll get to the gym knowing that your trainer will have a routine mapped out for the session that will take you a step closer to you achieving your aims. It is down to you to make this happen – to get there and do the exercises that are in the plan. You’re not going to get to the gym and wonder what you will do during the session. You’re not going to take it easy because you’re not in the mood or only do the exercises you like and are good at. You’re not going to try something else instead because it’s taken your fancy. And you’re not going to spend time chatting with others because you have no set regime or time within which to complete it. You’re going to get there, focused, knowing what you need to do, determined to do it and getting on with it as soon as you step into the gym. And you’ll have your personal trainer there making sure you do. A well-defined strategy will do the same for you and your business. Each day you will know what it is you need to achieve that day and you will be more focused and productive because of that. Your time will be yours and not belong to others through emails and telephone calls. You’ll get twice as much done than if you had no plan of what you want to achieve and how you will do it. You are far more likely to go to the gym when you have a session booked with your personal trainer and you will work harder and achieve more in each session. Yes, I’m seeing a personal trainer (started a couple of months ago) and without doubt I cycle, row (with a history of dislocating my knees running isn’t part of the program) and do the other exercises much harder and for longer, because my trainer is pushing me, than I do when I’m in the gym on my own. I’m sure if you’re also working to a diet plan that knowing you’re seeing your trainer and having a weekly weigh-in will incentivize you not to have that extra glass of wine or that dessert. Each day in your business you will know what it is you need to achieve and you will be more determined to achieve them when you see the tasks as part of an overall plan and the knock-on effect of not finishing them. You will also stick with doing what is set out in the strategy plan. So, you know you’re doing the right tasks because they are linked to the right objectives, which are linked to the right milestones and goals that will get your business to where you want it to be. You will no longer doubt if what you are doing is effective and good for the business. Distracting emails and shiny objects will have to work that much harder to get through your drive and determination to complete the planned tasks set. Basically, you will get more of the right things done and waste far less time. Without doubt your personal trainer wants you to meet your goals. Her continued employment and reputation depends on it and the personal connection she builds with you creates a bond so that it feels like you’re in this together. The result is a far greater chance of your fitness and health goals being achieved and all the physical and psychological benefits that brings and not least, a huge sense of achievement. And the chances of keeping your business on course dramatically increases. Your strategy is all laid out. You reach the next milestone and feel that sense of achievement on top of the rewards it brings your business in terms of new customers and higher revenue and profits. 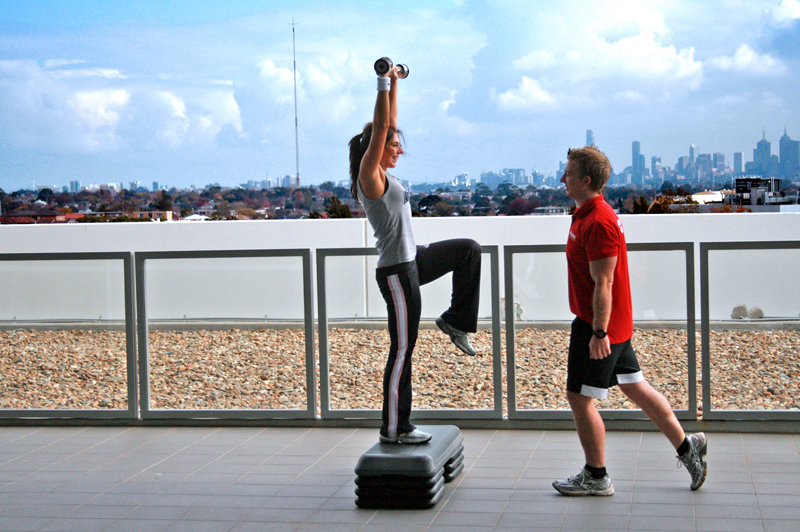 Without a personal trainer you can reach a certain level of health and fitness. It will take longer and the results won’t be as impressive. With a personal trainer you will achieve greater fitness goals in a shorter period of time because you have someone showing you what you need to do, supporting you and keeping you focused and on course. Without a strategy plan your business can do ok and, provided nothing unexpected happens, could keep going that that ok level. It will take longer to grow your business and the results won’t be as impressive. With a strategy plan you will achieve greater results, quicker because you have a detailed guide that shows you what you need to do, how to do it and which keeps you focused on doing it. A top sports person knows how to stay on top of their game – they know what training programs to put together and the diet they should have. And yet they still have a coach to watch them, guide them and keep them on track. The right strategy plan and strategic planning system will do the same for you and your business. Not sure how to create this vital strategy plan and strategic planning system? Check out my coaching program and see how I can help. The return is always worth the investment. My name is Christopher Briggs and I aim to reduce the number of businesses that fail. I help business owners achieve extraordinary success in today’s tough business environment. 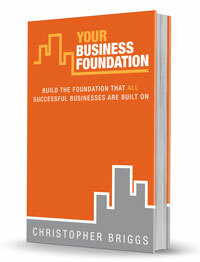 I am the author of Your Business Foundation and the creator of the Business Foundation Blueprint, my step-by-step system for establishing strong business foundations.